So you’ve decided on a trip to Cancun, lucky, lucky you! With white sandy beaches, gorgeous sunsets and turquoise water, it’s holiday paradise. Our Guide of Where to Stay in Cancun will help you narrow down where to stay. 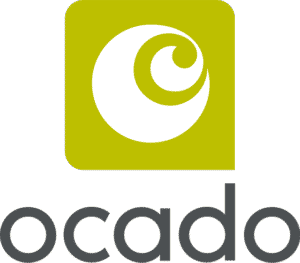 From budget-friendly hostels to high-end luxury, to hotels that cater for families ones that are specifically adults-only. There’s something for everyone in Cancun no matter your budget or who is travelling. 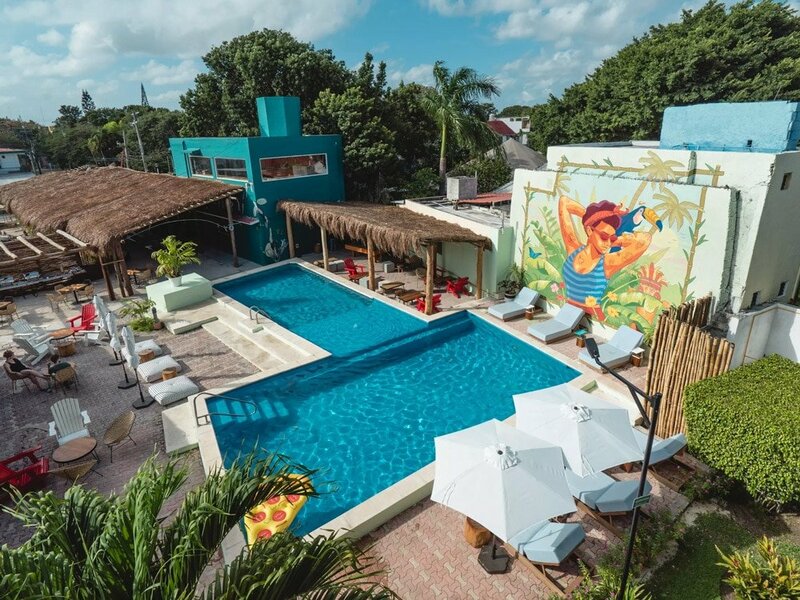 This hostel chain has been a huge success in many cities in Latin America, and its Cancun venue is no exception. Selina Downtown hostel in Cancun is a place that offers everything you need without breaking the bank.. It has a nice swimming pool, yoga deck, movie room, and a range of rooms (from bunk bed dormitories to a full suite) at very affordable prices. 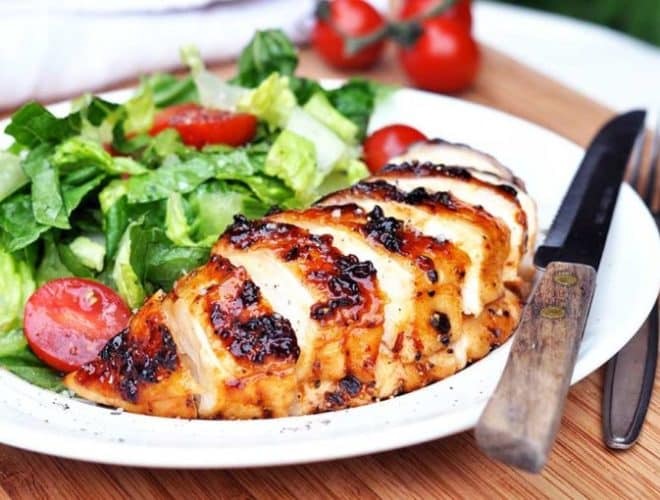 Located in the heart of Cancun’s Hotel Zone, the Hotel Cancun Clipper Club is a great choice for those who want to be well positioned but are on a budget. 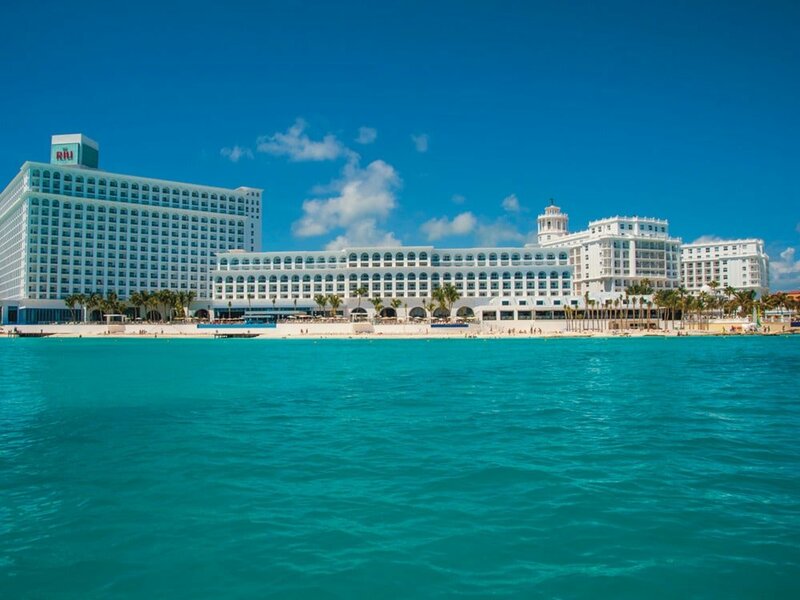 The best part of if (besides its nice facilities) is that it is just a 5-minute walk to get to the public beaches, as well as it will take you slightly longer to go to all the clubs and restaurants in Punta Cancún. Hotel Cancún Clipper Club, Blvd. Kukulcán Km 8.5 Zona Hotelera, 77520, Cancún, Quintana Roo, México. This all-inclusive hotel in Cancun is set on a white sand beach with rooms that overlook the dreamy, turquoise Mexican Caribbean waters. Its Mediterranean architectural style stands out amongst the other hotels, as well as its unbeatable location. You’ll be perfectly positioned for shopping, restaurants, and local bars. Hotel Riu Cancun, Blvd. Kukulcan, Km 9, Manzana 50, Lote 5, Zona Hotelera, 77500, Cancún, Quintana Roo, Mexico. 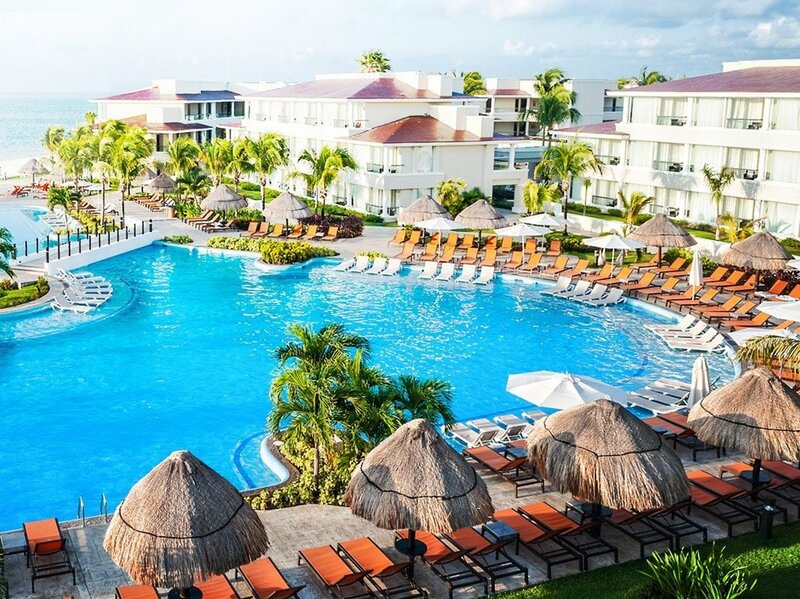 Located just 10 minutes away from the Cancun Airport, the Hotel Moon Palace Cancun is a resort with all the fabulous amenities you would expect from a mid-range accommodation. Packed with tons of activities including a children’s club and wave rider, it’s a great choice for families. Located outside the crowded Hotel Zone and very close to the Airport, makes for a more convenient getaway. Kudos for the free transportation shuttles in-between the Moon Palace Cancun and the other Palace Hotels in the area. Hotel Moon Palace Cancun, Carretera Cancun-Chetumal Km. 36.5, Riviera Maya, 77500 Cancún, Q.R., Mexico. This beachfront paradise deserves a special mention due to its adult-only policy, décor, and incredible food. It has a sense of privacy and seclusion that make it the perfect place for honeymooners. With romantic views of the Caribbean, Cancun skyline, and Nichupté Lagoon, it’s the perfect place to unwind and connect. Secrets The Vine Cancun, Blvd. Kukulcán Km. 14.5 Retorno del Rey, Lot 38 + 38-b, Zona Hotelera Cancun, Q. Roo 77500, Mexico. 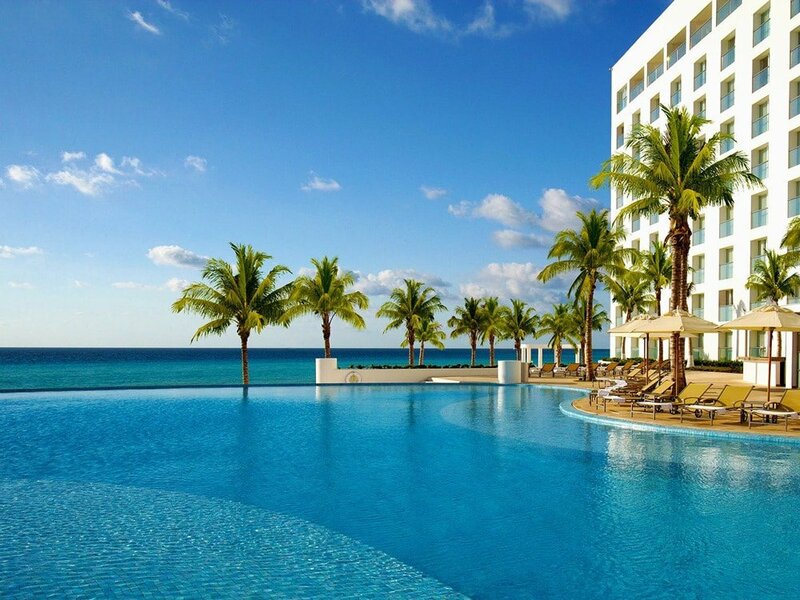 The Royalton Riviera Cancun is the definition of a modern hotel in a beach destination. It has been popular for more than twenty years. The Royalton is perfect for families and groups of friends alike. Royalton Riviera Cancún, Carretera Federal 307 Cancun-Playa del Carmen Km 332 MZ 3 lote 15, SM31, 77500 Cancún, Q.R., Mexico. As mentioned in our guide to the Best Hotels in Mexico, Le Blanc is a fab choice in Cancun. Located in the Northern part of Cancun’s Hotel Zone, Le Blanc Spa Resort has a minimalist style. Complete with Butler services and BVLGARI designer toiletries in every room. For the most dazzling views of the Caribbean Sea, make sure to book one of the rooms in the upper floors. And don’t forget to reserve at least one day to indulge yourself at the BlancSpa – pure bliss. 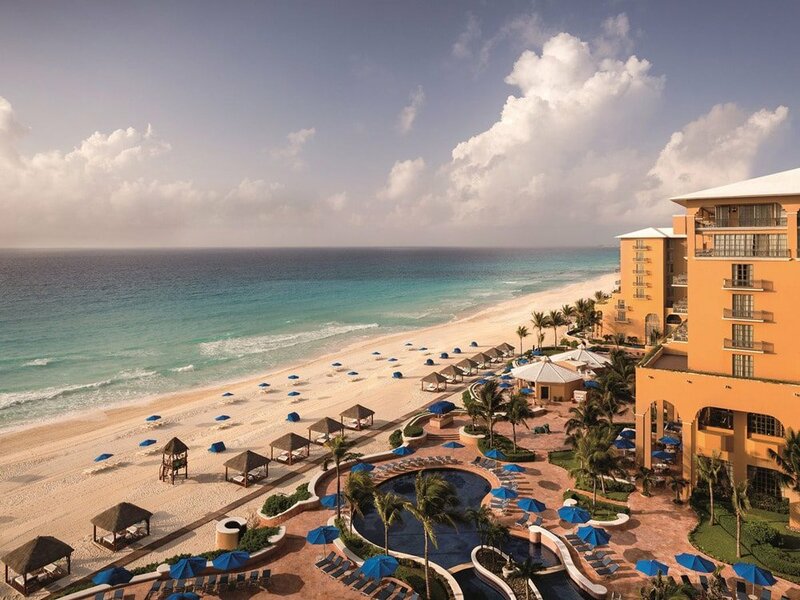 Last but certainly not least on our list of Cancun hotels is the Ritz Carlton. With a wide variety of high-end restaurants and a luxurious moroccan inspired lobby, The Ritz-Carlton Cancun certainly pays homage to its elegant signature in all of its 365 rooms. While many of the local hotels are adult-only, the Ritz-Carlton welcomes families with loads of suitable amenities without losing its refined elgance. The Ritz-Carlton Cancun, Retorno del Rey 36, Zona Hotelera, 77500 Cancún, Q.R., Mexico. So there you have our top Cancun hotels for every budget. Be sure to check out the rest of our Guide to Cancun for more tips.